Daniel and John Krokidas did promote Kill Your Darlings on the Radio show Milling About from BlogTalkRadio. Listen to the interview below with thanks to Robin Milling. It's also a podcast on iTunes. Daniel Radcliffe was once the bespectacled boy wizard of Harry Potter. With a bit of a scruff and near 25 it doesn't seem odd that he prefers Dan. Speaking to him since he's 10, you happily adopt the name as he's permanently left the Hogwarts building. 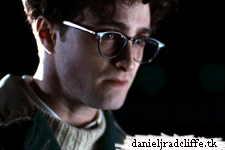 In Kill Your Darlings he may still be wearing Potter-shaped glasses but the comparisons firmly end there. Dan joins host Robin Milling to discuss taking on the role of Beat poet Allen Ginsberg. He tells Robin he modestly dabbled in sonnets when he was 17, but now he's working towards writing screenplays he can direct.